I'm candle obsessed i normally have about 4 candles going at the same time along with my burner so when I got the opportunities to try out the Valley Mill wax melts I was very pleased. 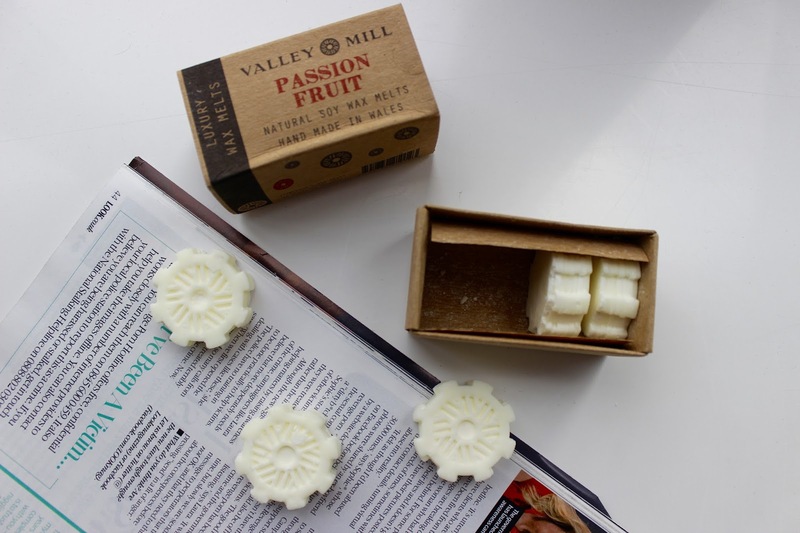 Valley Mill sells a range of different products such as candles, soaps, slate signs and kitchen ware. When picking from he wax melts I choose the passion fruit scent which was quite hard when there are so many amazing scents to choose from such as chocolate truffle, jasmine, welsh cake and coconut. I love the matchbox feel to this product along with the shape of the wax melts there rather cute and different from most melts. The box comes with 5 wax melts inside priced at £6.25 which I think is rather good. Onto the main factor with this product... the smell! They have a strong scent which is true to the actually scent purchased without being too over powering. The wax melts themselves are also quite big compared to most so it really is value for money. Overall I'm really impressed and will definitely be purchasing some in the future. I'll check out their website, though I do seem to be having an issue at the moment with not being able to smell candles when they are lit. I hope my sense comes back soon! I love candles too! Passion fruit sounds delicious!